BBC NEWS | Have Your Say | How can we help Darfur's refugees? How can we help Darfur's refugees? The director of Unicef has warned that a humanitarian disaster is looming in Sudan's Darfur region. Arab militias backed by Sudan's government have been attacking villages after a rebellion began last year by fighters claiming the local black African population was being oppressed. The UN has appealed for $55.8m to help the estimated one million people displaced by fighting. How can we help Sudan's refugees? Has the world community been too slow to react? How should multinational charities respond? We were wrong to go to the Balkans. If there was no real WMD fear then we were wrong to go to Iraq. We should learn from our mistake and stay out of Sudan. How can we help Darfur's refugees? Easy. Stop talking about it and take serious action. We can't, unless people in this part of the world stop fighting, killing each other and depending on the rest of the world for food and shelter. These countries are rich in various natural resources and it's a shame they should be a burden to the rest of the world. It's high time they get civilized and learn to stand on their feet, not relying on UN handouts and debt relief from other countries. Instead of invading Iraq, the International coalition forces, with UN blessing should go into countries like Sudan, throw away the illegitimate and power hungry warlords and restore order. Why hasn't a single Arab come forward to say: Shame on these militias, they are a disgrace to the Arabs. Or is the Arab outrage only reserved for the Israeli-Palestinian conflict or the Iraq war? I think it's a pity to say that the international community has not learned from Rwanda genocide 10 years ago. If the UN is not able to intervene, I think Nato could intervene as it did in Kosovo or how the EU did in Congo last year? How many deaths are we waiting for, so that an international intervention can take place in Sudan? Darfur's refugee crisis is again a shame for the whole humanity! If the West takes any action, there will be denouncement followed by violent resistance. Africa must work to solve African problems. Yet another example demonstrating that it is folly to place one's hopes on the UN. I am Sudanese. The UN did and is doing a great role as well as President Bush with peace pressure on Sudan. When you build a house for rain protection, you start with poles and then put the roof on it so that rain cannot rain on you. To me, it looks like the international community put the poles in for Sudan but not the roof. So the question is, how can you prevent getting wet from rain when you are in a house without a roof? In reality, Sudan still needs more effort from the international community. I wish people would stop saying that the UN should do something. The UN does not have an army or any way to force Sudan to do anything. Unless major countries with serious military and logistical resources are willing to step in nothing will happen. The US and UK are too busy in Iraq and Europe is too timid, so the Sudanese will keep dying. I don't understand why the United Nations is so low in action in regards to Darfur situation. It seems that the UN has never sensed the abysmal condition of Darfur citizens. Please, there is an urgent need for humanitarian intervention in the region for the purpose of protecting human security. Enough is being said. Action is needed now! It is time has come to build a permanent global capacity for humanitarian purposes. The UN should think about it. These events should not be left to the whims and fantasies of one or two countries but the whole process of responding to humanitarian challenges should be institutionalized through global capacity building for humanitarian purposes. It will include trained troops not only capable of fighting but also reconstruction and rebuilding. The UN should be given the powers and resources to act in Darfur to defend the oppressed. But has anything changed since 1994 when the UN wanted to act to stop the genocide in Rwanda. Then, their calls were completely ignored and one suspects the same scenario will be played over again and again because of self interest. Just like with Iraq, the UN won't end up actually "doing" anything. It will discuss the situation, pass resolutions, debate the issue - debate the issue some more - debate the issue perhaps a little longer, and so it continues. While this is going on, hundreds of thousands of people will have lost their lives due to the organisations hesitation to actually get something done. How people opposed to the Iraq war can say with a straight face that the UN should have been given a greater role is laughable. Media coverage of the Sudan crisis has been very little to nothing in the United States. It is sad how information is so limited in the U.S media. Our media rarely cover any issue in Africa so Americans have very little knowledge of it. Why is so little being done to help these people. To make the world a real free and safe place, is to help get rid of hopelessness, poverty and starvation. NOT WAR! Someone who preaches humanitarianism should better help. All the countries that refused to fight in Iraq because of "respect for Human rights" now human rights are not being infringed and its not America doing it. They could at least send 10 soldiers. It works! I think the US should ignore the usual anti-interventionist (and often knee-jerk anti-American) critics and help the black Africans who are being butchered in Darfur. Sub-Saharan Africa has consistently welcomed American and Western help when horrible atrocities are taking place. If the world stands by and watches yet another large scale African tragedy then surely there is no real international community. 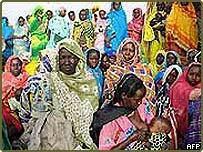 We all can help the victims of the Darfur conflict by donating to the relief agencies assisting the refugees in the region. The "How to help" link on this page has helpful information on who you can contact to lend your assistance. Please make a donation today! Make safe havens for these people in their own countries using Islamic countries as international peace keepers funded by the international community. Educate and offer birth control to the people with a limited fund from the international community for growing crops irrigation etc learnt by the Sudanese themselves. Too slow to react? How about incapable of appropriate action. Once again the UN, and the international community as a whole, has shown just how inept it is at ensuring Human Rights. What is really ironic is that Sudan is a member of the UN Human Rights Commission. This same Commission voted off a founding member, the United States in 2001. Regardless of how much the UN appeals for money, they we not be the solution because they are already part of the problem. Where is the Arab World's response to Kofi Annan's plea asking them to stop the genocide? The story on Sudanese refugees has to be a wake up call to the international community to stop yet another example of ethnic/racial cleansing. Once again, African lives are at stake and the world turns its back! Let's hope the UN can wrest attention from other atrocities long enough to stop the Arab militias and relocate the refugees. Surely, a little help now will go a long way relative to other world hotspots. In the meantime what can I do but express my fear for the women and children of Darfur, and vent my feelings of outrage to anyone who may listen? Please tell me? We are a world of caring human beings. Why are we letting the power-hungry rule the world? We have strong governments in this world which are able to arrest such atrocities. Let's not debate the issue, just send them food--NOW! Worry about the "consequences" of feeding starving people later. There is a lot of hypocrisy on the part of the British and American governments with regards to Black Africa. The world community has not been too slow to react, they have no interest in reacting at all. It is easy to organise against Saddam Hussein, but the same or worse evil happening to our people in Sudan is taken as secondary. Remember that these borders within which we are being persecuted are of the making of the British. Therefore, I believe the British are obliged to take a leading role in finding a solution. You weakened us and now you abandon us at the hour we need you most. I pity the plight of the people in the Sudan's Darfur region. They really need the help of the International community. But come to think of it, the whole world has viewed USA as people who interfere into the politics of other countries. Now who is going to save that country if the USA does not take the lead? As for the Arab world they are rich but never spend for the sake of humanitarian purposes. If it was a religious war they will spend Billions of dollars to support the war. US is already overstretched and has developed a bad name in this respect, so let France, Japan, Canada, Australia take the lead this time. Otherwise it is now that we will know the worth of US interventions. The UN should stop dithering and do something. Send in the troops to protect the people and secure supply lines to get the food in now, not next month. The UN is losing yet more credibility by just wringing its hands and procrastinating. I can see the UN going the same way as the League of Nations unless it finds some courage and direction. Of course we can help. As an Arab I will put all political agenda on one side and all resources should be used to save lives. Arabs should stand up to this problem. This is a case where Arabs can demonstrate their human side, but so far they have failed. The sum of $55.8m is spent every day on useless armed forces let us save lives. I call on all rich Arab nations to give all they can to solve this problem and help these people. I believe a lot of European politicians are using the problem of asylum to foster their political gains while completely neglecting the cries of the refugees. The reality of the situation has not been fully addressed and there is also the problem of brutality from some European police departments which are either considered a non event or the victims are intimidated into silence. I know because I have seen some causes first hand. There is the need for more action and now before things get out of hand. Never mind about Europe; The UN; America etc., why don't we ask the Sudan-India-Malaysia-and China consortium which are taking the Oil profits out of the Muglad Basin oil field at Heglig. The Sudan takes about 10% the remaining 90% is split between the other three partners. This field is just to the east of Darfur. There are also strong signs of Oil and Gas having been found in the Darfur region. I wonder if this has anything to do with the Ethnic cleansing? We live in a time where technology and world trade has never been so advanced. So many ills could be eradicated; unfortunately, it takes great leaders, and great humanitarian strength. Suffering, violence and famine will always be there as long as greed gets in the way. The international community has been too slow to react on the problems the Darfur region is facing. If the government of Sudan is contributing to what is happening in that region and millions of human beings are in the danger of dying of hunger, I surely think it's important for aid relief teams to be sent in that region and they should be guarded by peace keepers. If worse goes to worse the international community should be ready to fight the militia group that is causing all the problems there as long as in the end there will be peace, freedom and satisfaction. The UN should be given the support and backing it needs to prevent an impending famine. It's time the International Community took pre-emptive measures when it comes to crises like this, and not sit idly by to pick up the pieces. One can't help but feel a tinge of cynicisms with George Bush and America spending vast sums of money on a foreign invasion, as opposed to preventing a famine. The U.N. needs to fulfil its purpose. It needs money and support to do this and the will to take action. Too often it does not. America should walk into Sudan, kick the government out, and restore peace and good order just like they did in, er, Afghanistan and Iraq...? Send the French Military to the rescue. How about the Blue Helmets? Where are all the countries, other than the US, that supposedly care about human rights ? Why bother? If not these people then some other country will need our help as soon as we try and get this one sorted out and it will happen again and again and again, ad infinitum. Just let them get on with it, sort out our own back yards first before thinking about anyone else - selfish? No, just realistic. I wish people like Peter in Germany would stop painting this as a religious conflict. It's simply untrue. Both perpetrators and victims share the same religion. The way to help both sides is to offer carrots and sticks. We should sit down with the Arab militia and try and negotiate a settlement. If they're willing then we help them. If they're not, then we impose sanctions. People like Bilal Patel from London, are too soft on the situation. You do not negotiate with terrorists, that is one of our Government's policies, and these people are terrorists. How can one expect to sit down with evil twisted minded people and make peace. NO. That just isn't the way, I agree with the opinion of Peter from Nottingham, we need to send a bigger force, and when I say we I mean the freedom-loving people of democratic nations. To crush the dictators, terrorists and oppressors and let all the countries of Africa and the middle east, and all others come forward and see what it is like behind the darkness which is terror. By giving Sudan's refugees food, water, clothing, medical care and a strong protective international police. Come on, EU. Come on, UN. Do something without the leadership of America. Aren't you capable of it? Must you rely upon the US whilst criticising and denigrating it? Any American intervention will be denounced as imperialism. So get off your humanitarian, international law high horse and do something. Or can't you? If there was ever a case for intervention by the UN, this is it. The UN should take over the country and only hand it back when a democratic government is elected, with the interests of the population at its heart. All the so called "war lords" should be brought to justice and let the people decide their fate. Developing countries funders of the UN have no benefits in Sudan or much of Africa. Thus, the problems of Africa are ever growing, with no one to help guide the light. Very sad. Where people are land- and power-hungry, there will never be peace. The Sudanese have been in trouble for years, pity we have taken so long to wake up about their plight! There will never be peace in Darfur while a fundamentalist expansionist Islamic military regime rules Sudan. Arab Islam has no place in the African Christian south. The BBC and the other news media should stop being politically correct reporting it as a conflict, it is plain and simply ethnic cleansing and genocide on a scale that pales the Balkans into insignificance.. Charities are powerless in the face of armies. The only way to keep the peace is to have a bigger more powerful force who'll obliterate anyone who breaks the ceasefire. That means America & America won't send more troops to another Muslim country. As a Muslim I am sickened by what is happening in Sudan. Once again another tragedy affects the Muslim world and the current band of tyrants sit back and watch it happen. Their can be peace in Sudan but only when the current tyrants and their thugs are replaced with an Islamic Khalifa Government.